BOSTON – Another prodigal show has returned home, and the good news is that the charm and good humor it showed a few years ago are still intact. 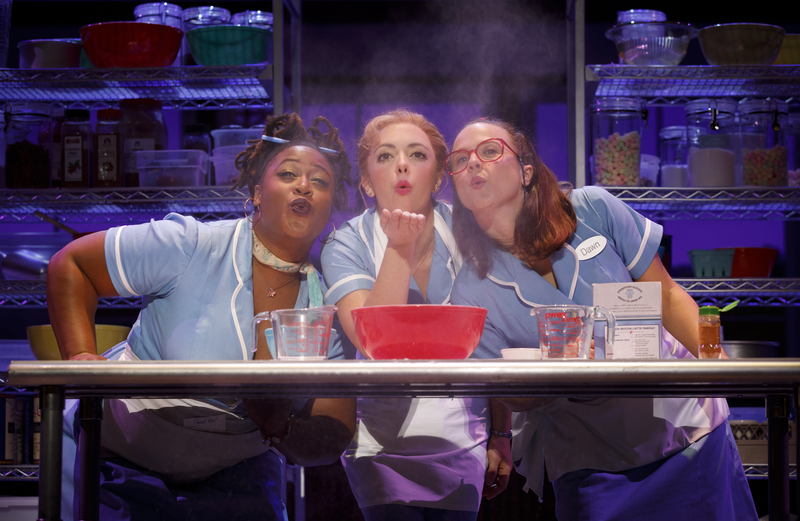 The musical “Waitress” began life at the American Repertory Theatre in Cambridge in 2015, and went on to Broadway, where it hs been a modest success and was nominated for four Tony Awards. The national tour is now at the Boston Opera House through March 4. 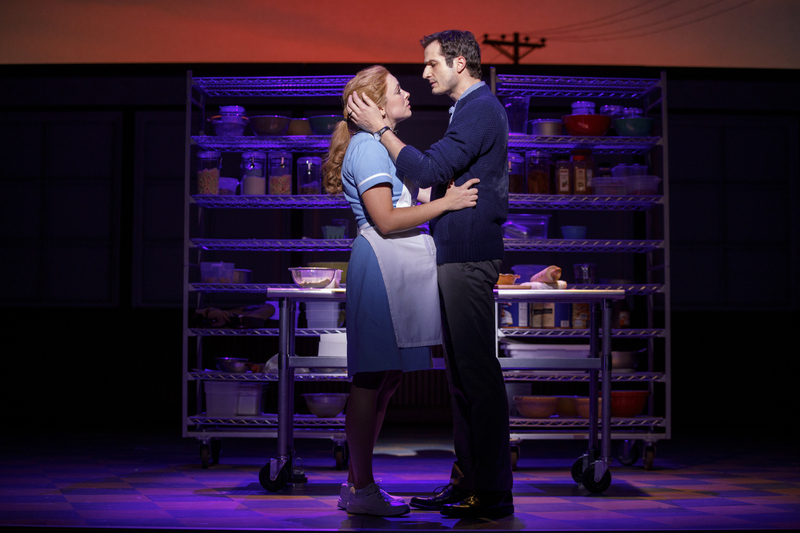 “Waitress” is the third show to follow the Cambridge-to-Broadway-to-Boston route. Based on the 2007 movie written by Adrienne Shelley, “Waitress” has a book by Jessie Nelson — a former waitress herself – dealing with meaty issues such as an abusive relationship, a woman who’s unhappy at the prospect of becoming a mother, and a married woman having an affair with her also-married gynecologist. As the play opens, there are certain symptoms alarming Jenna (Desi Oakley) and she breathlessly awaits the results of a pregnancy test with fellow waitresses Becky (Charity Angel Dawson) and Dawn (Lenne Klingaman) at Joe’s Pie Diner, “somewhere off Route 27” in an unnamed town. The positive result is not good news in this instance, since Jenna is trapped in a loveless marriage with an abusive lout named Earl (Nick Bailey), and a baby could complicate plans to eventually run away to a new life. That new life just might come from winning the $25,000 first prize in an upcoming pie-baking contest because Jenna has a skill that comes in mighty handy where she works. She is a dazzling pie maker – a pie provocateur if you will – and she assigns them the cutest of names, such as “The I Don’t Want to Have a Baby With Earl Pie,” and her creations are the star attraction at the diner. Nelson’s book resists the temptation to paint Jenna as a saint. She is willing to commit adultery with her married doctor and doesn’t appear early on to be a future candidate for Mother of the Year, but we are still rooting for her to find happiness every step of the way. Nelson leavens her book withplenry of humor, including Jenna’s interaction in the Sisterhood of the Apron: her fellow waitresses, who have issues of their own with Becky caring for an invalid husband, while Dawn has never really been on a date. Then there’s a sarcastic boss named Cal (Ryan G. Dunkin) who’s always riding them and threatening their jobs. The by now certainly pregnant Jenna finds her female doctor has left, and in her wake comes the handsome gynecologist Dr. Pomatter (Bryan Fenkart). He falls for one of Jenna’s pies “It Only Takes a Taste” before falling for her. Jeremy Morse – who originated in Cambridge the role of Ogie, the delightfully off-kilter boyfriend of Dawn who shares with her a penchant for Revolutionary War-era garb, is a scene-stealer of the first order, as is Dawson as the earthy Becky. Larry Marshall is Joe, a lonely old soul who generously dispenses wizened advice to Jenna about her personal life. Composer and lyricist Bareilles had no experience writing for musical theater, but the steady hand of the ART’s Diane Paulus, who directed, helped her through the process. What eventually emerged is a score that responds well to the situation and pairs up well with the characters and their skills. It has a strong country flavor, with a bluesy number (Becky’s “I Didn’t Plan It”), a show-stopping charming novelty/comedy song sung by Ogie (“Never Ever Getting of Me”) and the requisite heartfelt ballad near the end (“She Used to Be Mine”) aced by Oakley as Jenna. It’s performed by an energetic six-piece band that rolls on and off the stage. Maesha McQueen is a hoot as a sassy nurse who knows the score between Jenna and her doctor. “That (expletive) probably flies a lot further in Connecticut,” is one of her spicy rejoinders to Dr. Pomatter.